Thank you once again to Eric in San Francisco (Eric in SF@Flickr) for contributing an image (original) via the BPotD Flickr Pool. Much appreciated! Before starting with today’s entry: it’s looking like the garden web site, including BPotD, will be moved to the new server sometime next week (the lack of entries is due to my preparing for the transfer). Fingers crossed that this helps resolves some of the issues we’ve been experiencing. It won’t be Monday, though, as I’m also preparing for my lecture. Continuing with the “Plant Diversity and Food” series, today’s photograph highlights a food long in cultivation in the high Andes of South America (parts of Peru and Bolivia). These tubers are known as “bitter potatoes”, and can be either Solanum × juzepczukii (a naturally-occurring hybrid of Solanum acaule and Solanum stenotomum) or Solanum × curtilobum (a cross between Solanum × juzepczukii and Solanum tuberosum subsp. andigena). Domestication is thought to have began approximately 8000 years ago, with particularly extensive use in the past 3000 years. Unlike the common potato, however, they require processing before they can be ingested. Bitter glycoalkaloids are present in the tubers, and these are broken down by processes akin to freeze-drying. 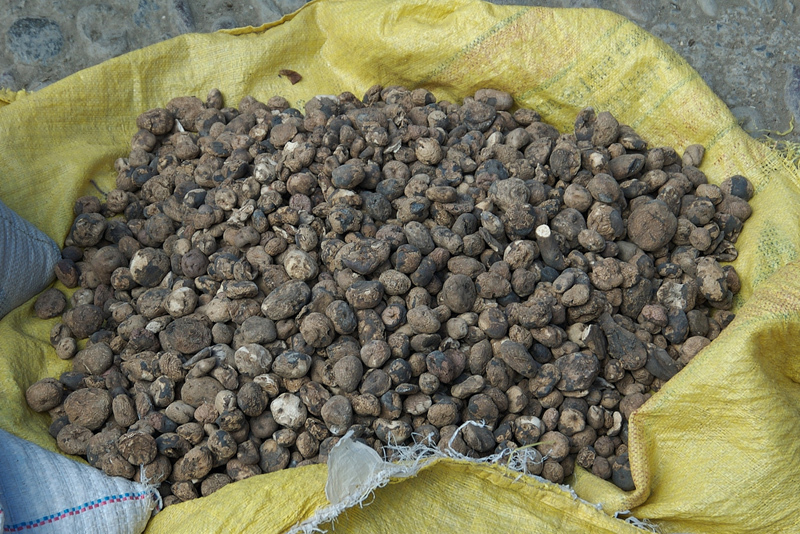 For the production of black chuño, the tubers are subjected to a series of night-day cycles consisting of freezing at night and drying in the high-altitude sun during the day. Black chuño is often later rehydrated as a principal constituent of soups and stews. White chuño is a festival food, and it is processed in a more labour-intensive manner involving peeling of the bitter potatoes and storing them in water or constantly spraying them with water before beginning the process of drying. In some instances, geophagy (in this case, the consumption of clay) is also practiced as a means to neutralize the bitter taste of these potatoes (ref: The Cultural History of Plants). When I was a kid, I always heard about those ‘1000-day-old eggs in China’ and ‘ancient black potatoes in Peru’- Food mysteries to Disgust Little Children and make them eat their own dinner. Soooo… it was great to get a potato photo and some details on processing. Thanks for this one – I am a student of Food Science and Food & Culture/History.